Vincent Van Gogh was a very misunderstood Dutch artist who created many priceless works. Though he could do anything from sketch to paint, he mostly painted. 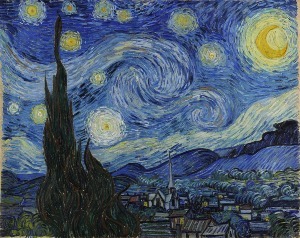 One of his most famous paintings is Starry Night, which he created in 1889. A self-taught painter, Van Gogh lived from only 1853 to 1890. In his lifetime, he produced over 2,000 oil paintings, watercolors, and sketches. Sadly, his art did not garner fame until after his death. At the beginning of his career, Van Gogh painted many rural landscapes and portraits of Dutch peasants. In 1886, he moved to Paris. Here, his style and technique changed quite a bit. He brightened his pallet, loosened his brushwork, and focused on emphasizing the physical application of paint on canvas. Each of his brush strokes became a representation of his feelings. He utilized this style, known as Post-Impressionism, for the rest of his life. In 1888, Van Gogh moved from Paris to the French countryside where he lived out the last few years of his life. In the Saint-Paul Asylum in Saint-Rémy located in southern France, he struggled with depression. It was during this dark time that he infamously cut off his own ear. Van Gogh wrote often to his brother, Theo. “This morning I saw the countryside from my window a long time before sunrise, with nothing but the morning star, which looked very big,” wrote Van Gogh. This view served as the inspiration for Starry Night. A now-famous oil painting, Starry Night is dominated by a large crescent moon that is surrounded by stars, including the morning star. Swirls race across the canvas like giant waves of light. Amongst all of this life lie bright orbs including Venus. The sky alone takes up about three-fourths of the canvas. Beneath the massive sky is a quiet village of houses surrounding a church. A large tree sits in the foreground of the painting: it is said to be a bridge between life and death. Vincent Van Gogh was a very talented artist who is still appreciated today. His experiences and emotions made him a better painter, and his works make these emotions relatable many decades later, to this day.